We appreciate you all for your comments and reading all of our articles by our very hardworking writers!! Please do us one more favor and follow us through Facebook and Twitter! Facebook – Friend us here! Facebook – LIKE us here! Two spectacular touchdown catches, two faked injuries, and one defensive fumble returned for a touchdown and the New York Giants got there first win of the 2011 season. The game started off with the Rams in total control, moving forward against the Giants defense. The Giants did prevent the Rams from scoring inside their own 10, which lead to a Josh Brown 21 yard field goal. On the Giants next possession they were forced to punt the ball. 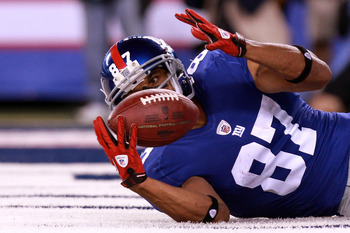 But thanks to a muffed punt, the Giants recovered the ball and set them up in perfect field position. Leading to a 3 yard touchdown pass from Eli Manning to Hakeem Nicks, and give the Giants a 7-3 lead that they wouldn’t let go. During the Rams next possession is where a lot of speculation is coming up. When the Rams went down into the Giants red zone, Deon Grant and Jacquian Williams both fell on to the ground, seeming to be hurt. What makes this play fishy is that the Rams were moving the ball well against the Giants, and both Grant and Williams just casually fell to the ground stopping all momentum on the Rams side and only giving up another field goal. The next score came off a pass backwards from Sam Bradford to Cadillac Williams that went off him as a fumble, and Michael Boley ran 65 yards for the touchdown as Cadillac watched not knowing that it was a fumble. If that wasn’t enough excitement Dominik Hixon caught a 22 yard touchdown pass from Eli Manning, before the end of the half, which he bobbled about three times before coming down with it making it a 21-6 game at halftime. The second half didn’t see much scoring, but the Rams managed to score another field goal and touchdown pass from Bradford to Danario Alexander. While the Giants Brandon Jacobs scored a touchdown off a 9 yard run. The final score being 28-16, and Eli getting another break. Eli threw for 200 yards, 2 touchdowns, and 1 interception. His 2 touchdown weren’t the best thrown balls, but his receivers made up for that with a spectacular catch from Nicks and Hixon. Eli did show much improvement from week 1 against the Redskins, but still needs to work on a few things. Especially going against the “Dream Team” Eagles next week. Bradshaw led the Giants with 59 rushing yards and Jacobs right behind him with 50 yards and a touchdown. Mario Manningham lead in receiving yards with 56 yards before being taken out of the game with a concussion. Hakeem and Dominik each had a touchdown catch.